The Amex Everyday Preferred Credit Card currently has an Informr score of 7.7 out of 10. This score is based on our evaluation of 10 sources including reviews from users and the web's most trusted critics. 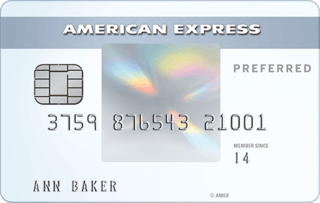 Amex Everyday Preferred Credit Card is typically available to those with good credit scores (650 or greater). The American Express EveryDay Preferred card can be a great choice for frequent users and families who spend a lot on gas and groceries, but a high annual fee and an onerous requirement to reap the card’s full rewards rate diminish its overall appeal. The Amex EveryDay Preferred gives you bigger rewards for spending on groceries and gas with their Membership Rewards points. You can redeem these points for gift cards, event tickets and more. Best of all, you can use them to book flights, hotels and cruises with American Express Travel. While other rewards cards only offer bonus points for specific categories of spending, this card offers a bonus on all your spending (if you meet the minimum requirement). The extra points for supermarkets and gas make it ideal for those with large expenditures in those areas, too. The American Express EveryDay Preferred credit card is one of the most lucrative cards in the ever- popular Membership Rewards program. Because of the fantastic rate at which you can earn points that are fully transferrable to any Membership Rewards travel partner, this card is well-liked among Amex loyalists. We like the Amex EveryDay Preferred Credit Card a bit better than its annual-fee-free sibling, the Amex EveryDay Credit Card, but it’s still not quite good enough to be a must-have in your wallet. Although it offers a good rewards rate on typical household spending, it can be pretty complicated to keep track of all that you’d have to do to make the most of this card. The EveryDay Preferred Credit Card from American Express is meant for someone with the discipline to use the credit card on regular, everyday purchases like groceries and gas. As long as you pay off the card each month so you don’t earn interest, this can be a great card. It will benefit those who typically make meals at home and drive cars as opposed to those who dine out and take public transportation, ride a bike, or rely on taxis to get around. Completing 30 or more purchases on your card will earn you 50% additional points or as much as 4.5 points for every dollar, therefore, make it your primary card. We think the Amex EveryDay Preferred Credit Card from American Express is suited to someone who’s a regular shopper at the supermarket and uses their card at least 30 times per month. Your preferred type of reward should be travel, especially if you tend to fly or stay with one of the American Express partners. American Express’s Membership Rewards portal has a pretty impressive range of redemption options, including appealing merchandise and convenient transportation. However, since it doesn’t assign an across-the-board value to redeemed points, it’s not the most intuitive or easy-to-use rewards portal around.